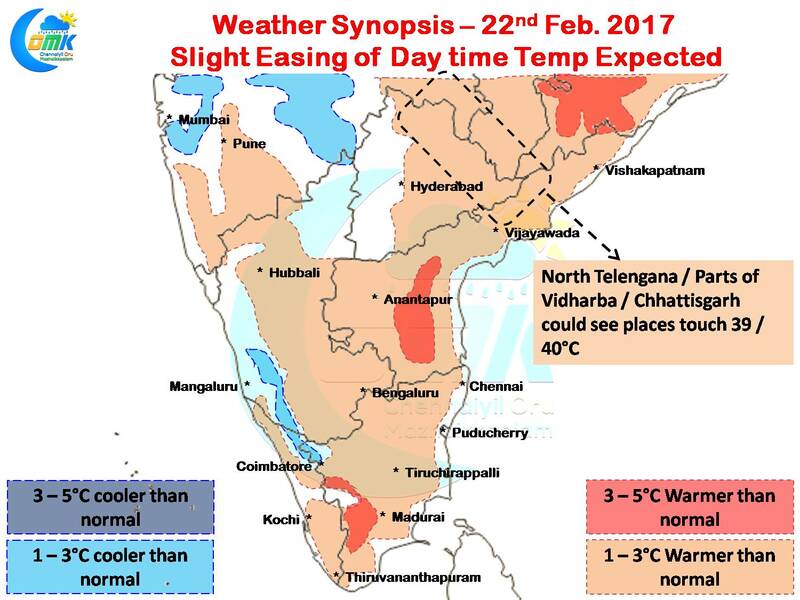 Yesterday saw another day of hot conditions prevail over Tamil Nadu as the mercury soared once again across Peninsular Region. Tiruchirappalli saw its hottest February day in a decade while Vellore recorded its hottest day for February in over 5 years. Both Chennai observatories recorded similar temperatures to Monday as summer like conditions prevailed across Tamil Nadu. While most parts of the state will continue to see day time temperatures in the region of 35 / 36°C there will be a slight reduction in the maximum temperatures compared to the last couple of days with a degree or two reduction expected compared to Monday & Tuesday. Neighbouring state of Andhra Pradesh will continue to see isolated places touch 38 / 39 degrees particularly around the Rayalaseema region. Similarly parts of Telengana, Chhattisgarh & Vidharba could see some places touch 39 / 40°C as early summer conditions prevail over the region. As the extreme Southern Peninsular India possibly comes under the influence of some synoptic activity possibly towards the end of the week under the influence of incoming Tropical Wave we could possibly see a reduction in overall temperatures in Tamil Nadu as cloudiness gradually increases. Chennai could see day time temperatures settle around 32°C with suburbs possibly seeing a degree or so higher. Overall though the maximum temperatures will be a degree or two lesser in and around Chennai compared to Monday & Tuesday. Early Morning Minimum temperatures will settle around 23 / 34 degrees.